What makes Raja Ampat is a famous vacation spot in Indonesia? Well, it is a beautiful archipelago with a formation of wonderful islands, after all. One of them is called Misool, which is famous for its beaches. For those looking for a reference, there is Namlol Beach. It is a perfect destination for a family outing and photography. Moreover, the beach is crowded, especially during holidays and weekends. It is safe to say Namlol is one of the most significant tourist spots in Misool. Thanks to its unspoiled nature. In terms of nuance, the beach has no much sand area. That means tourists won’t be able to perform beach walking or any activities, which are related to sand. On the other hand, Namlol is surrounded by small karst islands, covered by bushes. The water is shallow and it features numerous small corals. 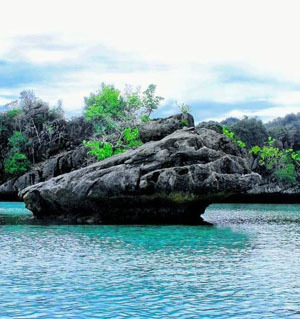 Usually, visitors might rent a regular speedboat to get to the beach and observe those karsts. The thing is they need to pay for such service, and it might be expensive sometimes. What makes Namlol Beach popular? That’s the question. Most tourists are attracted to its water clarity. It’s common knowledge. Almost all beaches in Raja Ampat Regency features crystal clear water. Still, Namlol is considered better than others. That means visitors are able to enjoy nautical beauty without hassles. The vast ocean and calm waves never cease to amaze tourists, after all. That means the beach is suitable for sightseeing and nautical observation. It is even possible to get in the water and feel its freshness. Some people call Namlol as the pond of the sea, as it is quite clear and pure. The best time to visit and explore the beach is during the low tide when the corals are seen plainly. Not to mention a single pond may appear, surrounded by sand. It is because of the low tide's effect, after all. That means such pond won’t be visible during high tide, so visitors should come at the right time to witness such natural phenomenon. Also, it is important to carry a camera, so they can take pictures of it. Near to Namlol Beach, there is another unique natural attraction. It is the lagoon. The location is in the back of the beach, which offers better corals. Not to mention the water is rejuvenating. This explains why tourists would likely to swim in this lagoon when they are visiting the beach. The location is also suitable for snorkeling! Thanks to the best visibility. Due to this reason, any people coming to Namlol should have prepared snorkeling gears beforehand. For those coming from Jakarta, they need to head to Sorong City. In this case, an airplane becomes the most recommended transportation to reach the location and the destination is Eduard Osok Airport. Next, they must head to Sorong Port to rent a speedboat. The last destination is Misool Island, where the beach is situated.